On the 2nd August, the energy mix of the Leo sun and Aquarius full moon will culminate and offer us the opportunity to renew, build and strengthen our faith and confidence in ourselves, our hopes, beliefs and ultimately our future. In Tarot terms we will experience a liberating Strength/Star combination, which is beneficial in helping us to let go of people, situations and beliefs that have a negative influence on us. With the Sun in Leo (Strength) over the last couple of weeks, you may have felt the need to express your creative urges, feed your passions and assert yourself in relationships with people in both public/professional and private areas of your life. At times it may have felt hard to persevere; you may have questioned your abilities and lacked confidence. Despite talent and knowing deep down you are on the right path, it can be hard to be consistent without trying to force or rush issues. The full moon in Aquarius (Star) will give you a welcome boost to assert yourself with confidence with eye-opening and liberating new insights. I love the Strength/Star energies that are coming into my life over the forthcoming days. They can be beneficial for all of us. What will you be focusing on over the next couple of days? How will you make use of the Leo/Aquarius energies? 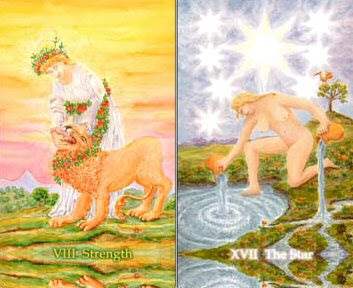 What further insights does the image combination of Strength and the Star hold for you? Thank you for this very timely post! This is exactly what I need. I have really tried to hustle my way in my business and I need to find a good balance between putting a lot of focused energy into my business and letting go of controlling the outcome. It's tricky but it looks like I will get some help : ). And I feel like being really creative and trying out new things! *soft smile* - hopefully, I'll be focussing on resting, relaxing and recovering from the stress of the past year as I head off on a short holiday. And then, when I get back, there are SO MANY business ideas I have to play with that my head is literally buzzing. So I guess that's my letting go AND my rebuilding all in one, right? I'm excited about this full moon and what it's bringing. I'm going to focus on creating things that are imbued with me-ness! Awesome! That's how it should be...enjoy! As a Leo I feel like this is really the time for me to step up and really take the next step in my business. I'm so excited to get in touch with this energy!